Royal Dutch Shell, Total, Statoil and Italy ENI will now avoid US penalties targeting companies which do business with Iran.Four major energy companies are pulling out of Iran in order to comply with US sanctions, the state department says. Naftiran Intertrade Co, based in Switzerland, will face new sanctions . 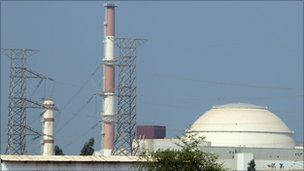 The US has tightened sanctions on Iran over concerns about its nuclear ambitions, which Washington fears are aimed at acquiring atomic weapons. Tehran insists its nuclear programme is for purely peaceful purposes. Recent legislation gives the US administration the power to penalise foreign companies which invest more than $20m ($12.7m) in Iran's energy sector. However, companies taking steps to comply with the law are exempted from penalties. "People are increasingly reaching the conclusion that it's simply not worth it to engage in activities with Iran," Deputy US Secretary of State James Steinberg was quoted as saying by Reuters news agency. Other energy companies are under investigation for possibly breaching sanctions, but the state department has declined to name them. Mr Steinberg described Naftiran - a subsidiary of the National Iranian Oil Company - as a key conduit for cash into the Iranian oil industry. In practice, US companies are already prohibited from doing most forms of business with Naftiran. But US officials say the extra sanctions will dissuade non-US companies from doing business with it. This latest announcement comes a day after the US froze the US assets of eight senior Iranian officials accused of serious human rights abuses following the disputed presidential election in June 2009. They will also barred from travelling to the US and from doing business with companies there.